As soon as the skincare queen, Caroline Hirons raves about a product I’m there…well if it falls in my price range! Since following Caroline Hirons a couple of years ago on her blog, I’ve tried to keep an acid based exfoliator in my skincare routine and I’ve tried a few in the past; Pixi Glow Tonic, First Aid Beauty Radiance Pads and the Clearasil Daily Clear Superfruits Refreshing Pads, but once I saw the Nip + Fab range on offer in Boots I knew I wanted to give these pads a test next. If you haven’t used ‘acid toners’ before, don’t be alarm – it’s not as scary as it sounds. First of all, I urge you to go check out Caroline Hirons blog for a far better insight into the benefits of acid (she’s a professional and will be able to explain far better than I ever could) but basically, they act as an exfoliator and far less harsh compared to those gritty scrubs.They generally contain a form of acid such as Glycolic acid, which work at removing dead skin leaving your skin smoother and brighter. As I mentioned before, I used a couple of acid toners in the past and although I love the Pixi Glow Tonic, I do really like the pad style exfoliators – basically because they are easier to use but also because I know I’m getting a certain amount of uses from one product (for example, if you get 60x pads I know it’s going to last 2months). 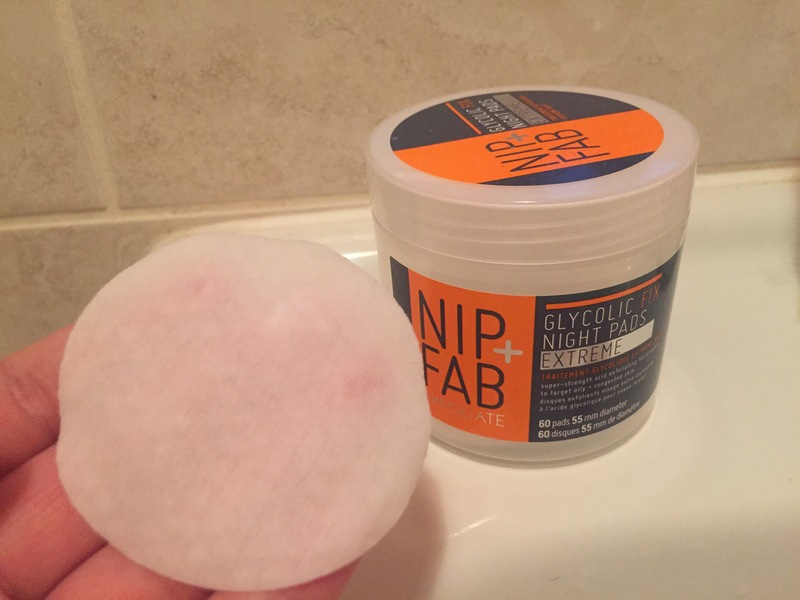 From the pad style exfoliators I’ve tried before (First Aid Beauty Radiance Pads and the Clearasil Daily Clear Superfruits Refreshing Pads), I think I’ve found a new favourite with the Nip + Fab Glycolic Fix Night Pads. These pads are fantastic because one pad works at doing several jobs in your skincare routine. These textured pads are soaked in; glycolic acid to exfoliate the skin, salicylic acid to unclog pores and combat blemishes and black heads, lactic acid to removes dead cells and smooth the skin and hyaluronic acid to hydrate and plump the skin. I use these every night after I have cleansed my skin and I have noticed a real difference in my skin. My skin looks brighter and I do find my blemishes don’t hang around as the salicylic acid unclogged and remove any dirt or impurities. These pads aren’t drying on the skin either which can sometimes be the case when using acids, however I do find they do leave behind a slight film on your face after use, but totally worth it in my opinion! I shall definitely be picking up these again, and it’s worth keeping your eyes peeled in Superdrug or Boots for when Nip + Fab are next on offer. 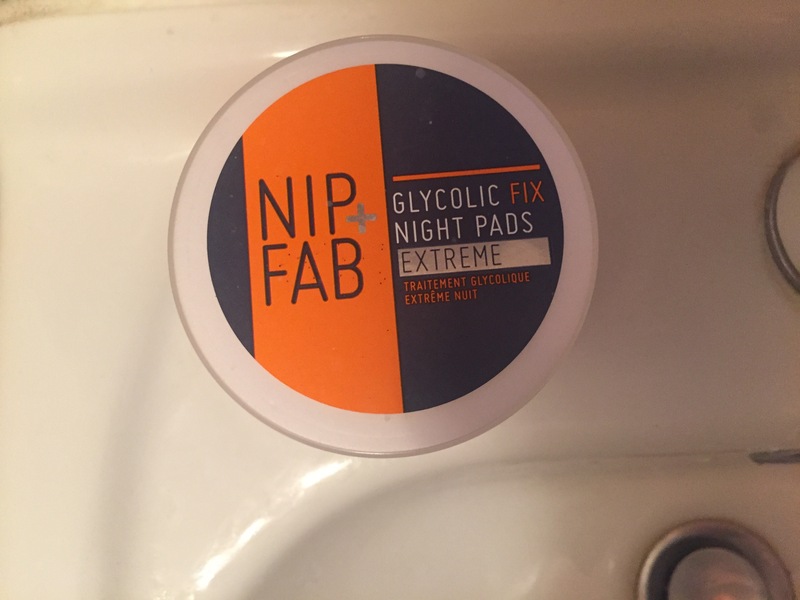 Have you tried the Nip + Fab Glycolic Fix Night Pads before? Do you use acids in your skincare rountine?